Like PQRS, the data completeness threshold for each quality measure is 50% of all eligible instances. However, unlike PQRS, all payers must be included (instead of just Medicare Part B) and the reporting period can be anywhere between 90 consecutive days and a full year. What exactly does 50% of all eligible instances mean? With all the terminology surrounding CMS's Quality Payment Program, it can be hard to track the meaning of program vocabulary. The guide below walks you through what an eligible instance is, and how to determine what 50% of your eligible instances would be. 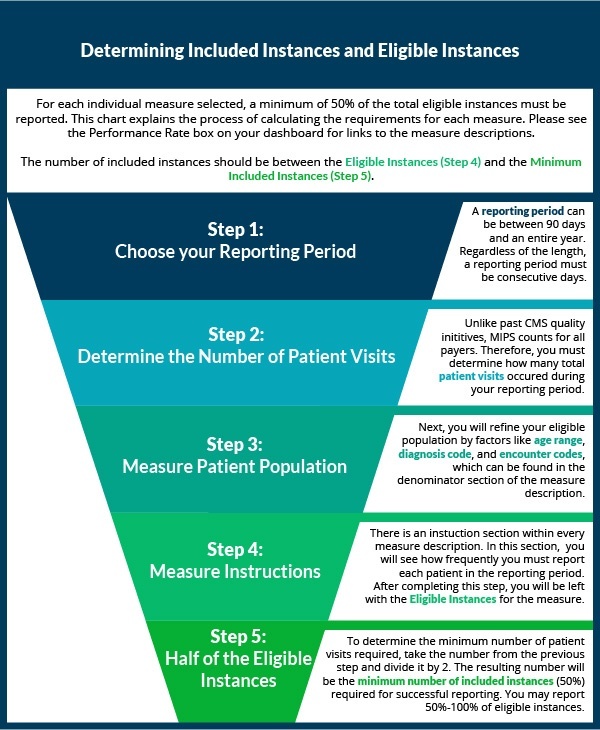 Although meeting the data completeness threshold of 50% of all eligible instances is sufficient for complete reporting in the Quality Performance Category, you will not receive more than 3% towards your MIPS final score (out of the possible 60% for Quality) unless you also successfully report either Advancing Care Information or Improvement Activities. CMS explains their logic behind this choice by explaining that they believe reporting the completion of an Improvement Activity is achievable for any practice. Improvement Activities are comparatively easier to complete, only require an attestation and documentation of completion in case of audit. We've previously written a guide to selecting Improvement Activities. Much like in the Value-Based Modifier Program, quality measures will be scored and assessed based on peer benchmarking from a prior performance period. At minimum, each measure will receive 3 out of the possible 10 points. If you wish to receive a maximized score for your efforts, be sure to chose measures with achievable performance benchmarks. If you have questions about quality measure reporting or any other aspect of MIPS reporting, check out our free educational resources or subscribe to our blog for weekly updates and tips. You can also request a free consultation with a Healthmonix team member at any time.